March 28th, Idaho: A nonprofit in North Idaho covers costs for hunters and trappers who successfully harvest wolves. The group, called the Foundation for Wildlife Management, pays up to $1,000 per wolf harvest. But what is new is the state of Idaho helping to fund the program. March 28th, North Carolina: For red wolves, the affirmation of their genetic uniqueness comes after some North Carolina officials and a small but vocal group of landowners pushed the government to abandon recovery efforts, arguing the animal is a coyote hybrid. March 28th: Dr. Dan MacNulty, an associate professor of wildland resources at Utah State University states "The elk population in Yellowstone started decreasing even before the first wolves were let out of their pens. People need to know that," MacNulty said. “What that helps set up is the fact that this elk population has decreased independently of wolves." March 26th: The one yellow and one green “dancing men” were flailing in the night when the calf was killed. OR-7’s Rogue Pack has been blamed. 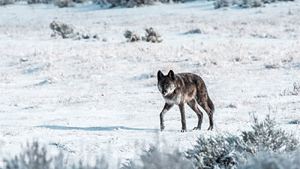 March 25th, Editorial: Wolves could easily expand their territory in the absence of human predation, but some people prefer to keep their numbers down and their range tightly restricted. Farmers and ranchers regard them as a threat to livestock. There are also hunters who love the idea of killing wolves as trophies. March 22nd: Arizona wildlife officials say three endangered Mexican gray wolves, including two in New Mexico, died last month. All the deaths are under investigation. March 22nd, Oregon: Oregon Department of Fish and Wildlife said Thursday that wolf activity has been reported by people in Douglas and Lane counties for several years and that in late 2018 biologists found wolf tracks. 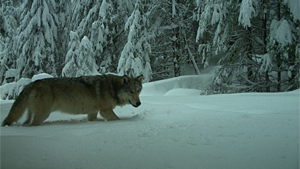 Cameras captured images of three wolves on Feb. 20 in the Umpqua National Forest. March 22nd: The National Parks of Lake Superior Foundation announced today that, with the support of the International Wolf Center, an urgent final effort is underway to move four to six wolves to Isle Royale National Park from Michipicoten Island (located in northern Lake Superior) where they are starving. March 20th, California: In December, Long Beach and other Southern California residents pressured the California Fish and Game commission to reconsider coyote extermination practices, which it uses as a last resort.According to Ted Stankowich, an associate professor of biological sciences who runs the Stankowich lab, the a fear of coyotes may stem from the fact that humans are not acculturated to living with them anymore. March 20th, Montana: The Interior Department's proposal to remove threatened and endangered species protections for wolves would end a decades-long restoration effort that saw a remarkable turnaround for an animal once nearly exterminated across the Lower 48 states. 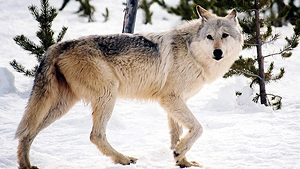 Legal wolf harvests began in Montana and Idaho in 2009. 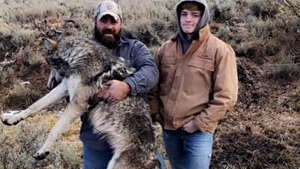 Hunters and trappers have since killed almost 4,400 wolves in the two states, according to data from state wildlife agencies obtained by The Associated Press and about 1,500 more were killed by government wildlife agents and property owners following attacks on livestock and similar. March 20th: Thirty-seven organizations today sent a letter urging the U.S. 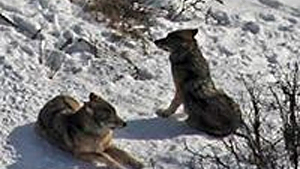 Fish and Wildlife Service to free two endangered Mexican Gray wolves trapped in New Mexico and halt additional trapping. “Mexican wolves are closer to extinction than the government admits. Removing wolves to placate the livestock industry is the last thing we should be doing to this profoundly endangered population," said Michael Robinson, senior conservation advocate with the Center for Biological Diversity. March 19th, Arizona: All film screenings will take place at the Mary D. Fisher Theater on Tuesday and Wednesday, March 26 and 27. Tickets are $12 general admission or $9 for Film Festival members. For tickets and more information, please call 928-282-1177. Both the theater and film festival office are located at 2030 W. Hwy. 89A, in West Sedona. For more information, visit: www.SedonaFilmFestival.org. March 18th: The definition of endangered is up for debate. Gray wolves occupy less than 20 percent of their historic U.S. range, notes Jeremy Bruskotter, a social scientist at the Ohio State University who has studied programs to save gray wolves in the United States. “Does that constitute recovery? It seems like a stretch to suggest that it does,” he says. March 17th, New Mexico: More than 70 prominent conservation scientists have signed a statement condemning killing contests as ecologically indefensible, but organizers still promote them as a recreational pursuit and a way to attract young people to hunting. March 16th, Montana: SB185 would have prohibited hunting of Yellowstone wolves outside the park’s boundaries. Out of an estimated population of 850 wolves in Montana, 315 have been killed this hunting season. SB186 would have prohibited wildlife killing contests, but the bill was tabled. March 13th: According to new research by University of Wyoming scientists, movements of moose increased in early winter following encounters with wolves, but only when wolves were within about 550 yards. The findings, published today (March 13) in the journal Ecology, provide new insights into the interactions of the region's apex predators and their prey. March 13th, Minnesota: Wolves currently are hunted in the northern Rockies, but wolf hunting in Minnesota ended after the 2014 season when federal courts overturned the regional delisting. Now the U.S. Fish and Wildlife Service (FWS) embarks on another quest to remove the species from the nation’s endangered species list. March 13th: "In my attempt to deal with the death of a wolf I knew so well and admired so greatly, I thought of something I could do. I found the site where she had bled out and collected some of her frozen blood. I trudged through the snow to where 926 had been born, and where I had seen her play with her pups, and left her remains there. I did it for her family, but mostly I did it for her. She deserved to come back home." March 12th, Washington: “They are here, they’ve always been here, they will always be here,” said Sgt. Kim Chandler who is with Washington State Department of Fish and Wildlife. “They’ve adapted, plain and simple, they’ve adapted.” The coyotes that live in urban communities, according to Chandler, are looking to humans for their food source. March 12th, New Hampshire: New Hampshire HB 442 proposes prohibiting hunting coyotes during pup-rearing season. But the House Fish and Game and Marine Resources Committee voted to recommend that lawmakers reject the bill. March 10th, New York: There will be a photo exhibition of never seen before images of the Arctic Wolf, along with the Wolf Conservation Center, to benefit wolves. March 9th: The documentary “Epic Yellowstone: Return of the Predators” sees the park through the eyes of the predators. On Saturday, the film will have its world premiere screening at 7 p.m. at the Smithsonian National Museum of Natural History. On Sunday, it will air on the Smithsonian Channel at 9 p.m.
March 8th, Idaho: While protections for wolves in Idaho have already been lifted, there are some who believe that lifting the protections on a national level would lead to an increase in hunting and trapping of gray wolves that would move them back towards being considered endangered once again. President of the Idaho Trappers Association, Rusty Kramer, says, "I don't think its going to change anything in Idaho, because we have pretty extensive hunting and trapping season." March 8th, Canada: The deaths of these wolves are raising questions about how, and whether, wolves should be trapped just outside the boundary of the Banff Park, and how they can be protected. According to Jodi Hilty, chief scientist with Y2Y, the Yellowstone to Yukon Conservation Initiative, there were 11 wolves found in the traplines north of the park recently. March 7th, Wisconsin: State Senator Robert Cowles of Wisconsin said that he supports having a wolf hunting season in Wisconsin once again. "I’m happy that the federal government or Department of Interior is passing this back to the states, so our Wisconsin Department of Natural Resources can come up with a plan to shrink the herd somewhat," said Senator Cowles. March 7th: Scientists with the Wolves and Moose of Isle Royale Project have dropped wolves from Canada at the park for two reasons: to hunt a growing moose population and raise the dwindling wolf population in the region. "I am … blown away by the resilience of these wolves, who within hours after undergoing capture and handling and arriving on Isle Royale, immediately got on the trail of their pack mates," Mark Romanski, the park's natural resources division chief. March 7th: The translocation of four new Canadian wolves has boosted the Isle Royale park’s wolf total to eight — four males and four females — including the last two survivors of a dwindling population that had occupied the park for about 70 years . March 6th: New research suggests there may be more effective and less invasive strategies to reduce the ability of wolves to encounter caribou. 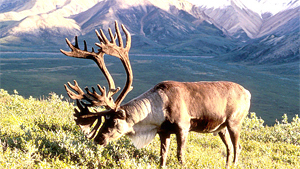 Researchers found that spreading logs, felling trees, or roughing the soil surface of the linear developments can be used as a habitat recovery strategy to disrupt the ability of humans and predators to access the critical habitats of at-risk caribou. March 6th: The Fish and Wildlife Service plans to soon publish a proposed rule removing ESA protections for gray wolves. Under the proposed rule, management for the gray wolves would be returned to the individual states, according to a statement from FWS . However, any proposed rule removing federal protections for gray wolves is certain to face legal challenges from environmental groups that blasted the announcement. "Wolves should remain listed until they are fully recovered and can take their place as key parts of a healthy ecosystem," according to Taylor Jones, WildEarth Guardians' endangered species advocate. March 3rd: Current laws in Germany place wolves under strict environmental protection, which makes shooting them possible only rarely and with official permission, or in a serious emergency. However, with the wolf population rising and on the prowl in Germany, Environment Minister Svenja Schulze is pushing for a new law to curb the damage they cause to farmers. March 1st, British Columbia: John Marriott, a wildlife photographer in British Columbia, actively advocates for animals that are being treated inhumanely and do not have a voice of their own. One of his biggest projects at the moment is campaigning for new trapping and hunting regulations, most of which have not changed since the 1930s. March 1st, Florida: Someone purchased Yuki from a breeder and realized he was too much to handle. They dumped him at a kill shelter at 8 months old. Shy Wolf Sanctuary stepped in and provided a home for him and he has been with them ever since. March 1st, Montana: One controversial bill sponsored by State Rep. Bob Brown would have allowed night hunting of wolves on private lands. Brown’s impression on the House floor of a wolf howl failed to win over colleagues who expressed concerns that night hunting would be unethical, dangerous and encourage wildlife poaching.